When you give so much of yourself to something, it is a must that you stop and rejuvenate in order to maintain and improve the quality of giving the very best of yourself. I recently took a break from my blog, because I was involved in so many projects over the last couple of months. Even though I write every day, I stopped posting regularly. Call it a hiatus, if you will. During my hiatus, I found it is necessary to expand my writing work, because it is clear we need to come together. There is so much power in the numbers of people, but the core relationship of the people must be solid. This begins with one relationship at a time. I’ve been involved in radio shows, conversations, conference calls, as well as different talking forums where people need answers. I want to help by re-directing, informing, enlightening, motivating and even educating if necessary. Thank you for your support, your responses, the sideline long chats and the kind words. I simply could not do it without you! In reading my blog, hopefully, you have taken notice that I do not sugar coat anything. Those who cannot accept truth are weak. We need the truth and we need the facts. Truth is not always dismal and bleak, which is why I take comfort in knowing that to every single problem, there is indeed a solution. This I know. 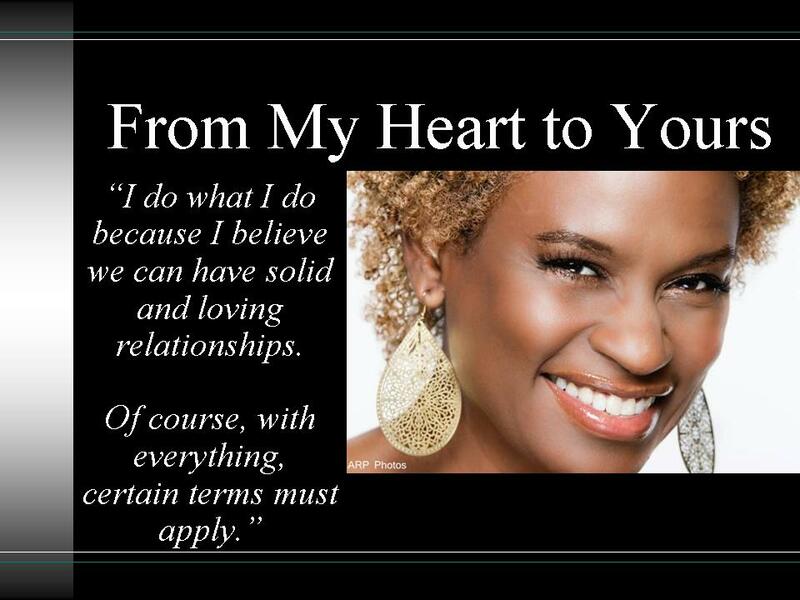 I do what I do, because I believe we can have solid and loving relationships. Of course, with everything certain terms must apply. For example, you can’t be ignorant and expect to have a relationship with an intellectual. You must either get with someone who is also just as informationally challenged as you, or raise your smart game. Again, there is a solution. My heart has become more loving for people. It is my desire to pave the way to enlightenment, in order to awaken the inner self power in others, which is also a part of the path to happiness, via the tool of knowledge. See, real people are happy because of what they know, and what they do with what they know, in order to get the results of what they want. There is a painful lesson I’ve had to learn, and I have taken it to bed with me, and pondered over it night after night. Reality does that to me sometimes. Some folk are just too proud to let go of their fear to have a healthy relationship. Others are too selfish to be giving and loving. There’s the angry folk who refuse to take the blame of their anger inwardly, rather than abuse their partner for their pain. And there is the stubborn, who believe they know what they truly can’t begin to see what they do not know— and that is they do not know a damn thing. Then there is the “unrighteous” righteous, who are the very hindrance to the light they should shine on their God, rather than be the blind darkness they self righteously share. All of these folk are damaged for many reasons that I cannot divulge in this writing. Damage can be repaired, but in order for the mend to begin, one must accept and know that the repair is needed. Some folk refuse to make the necessary change, even if it is at the risk of losing someone who is well worth keeping. So, my posts are for those who want to know and want to challenge what they know. They are for those who genuinely want information to enhance their lives, their relationships and the lives of others. I know that together, we can work towards a breakthrough, in creating a breakout, which will result in a plethora of successful relationships! This is why I do what I do. I wish you peace. Love well!!!!!! This entry was posted in Series from the Author-My Heart to Yours and tagged having a happy relationship, Natalie the relationship blogger, the cause for unhappy relationships, working together as a people to make our relationships stronger. Bookmark the permalink.